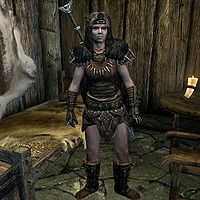 The Beautiful Barbarian is a Nord warrior and a possible assassination target during the recurring quest The Dark Brotherhood Forever. If chosen as the target, she will appear in the center of Ivarstead, just outside the Vilemyr Inn. Not knowing of her fate, she will ironically say to the player, "I'm dying for a rest. I swear, I could lie down right now, and just sleep forever." She wears a full set of Stormcloak Officer Armor and wields a steel greatsword. According to game data, she was originally meant to be found in the now nonexistent village of Granite Hill, rather than Ivarstead. Sometimes the barbarian will appear with nothing equipped, despite having armor in her inventory. This page was last modified on 13 July 2015, at 04:58.